This tutorial will show you step by step how to burn pictures to a CD or DVD in a few different ways using free and paid software. This tutorial will also show you how to burn photos to a disc without downloading, installing and using any special third-party CD/DVD burning software. You want to have a backup of your photos on a CD or DVD. You want to be able to play your CD or DVD on a DVD player and view your pictures on a TV. You want to send your pictures to someone who doesn't have internet. You can burn any image file type, such as JPG (JPEG), GIF, PNG, SVG, BMP, and TIFF to a disc. To burn photos to a disc you will need a blank CD or DVD, a CD/DVD burner drive installed into your PC and a CD/DVD burning program – or you can use the Windows disc burning feature. Ashampoo Burning Studio is a program for burning and copying CDs, DVDs, and Blu-ray discs. Ashampoo Burning Studio has a user-friendly interface, menu and a step-by-step wizard that will help you achieve your disc-related tasks, easily and quickly. If you want more information about Ashampoo Burning Studio, then click here (link with 60% discount). 1. Insert a blank CD or DVD into the CD/DVD burner drive of your PC. 3. In the left menu, you go to Burn Data and then choose New Disc. 4. Click on the + button located at the top right. 5. An Add Files and Folders window will appear and here you go to the location on your PC where your pictures are stored you want to burn to a CD or DVD. 6. Select all the pictures or folders and click on Add. You can select all photos or folders at once by pressing the [CTRL] + [A] keys on your keyboard. Tip: At Free Space on CD or Free Space on DVD located at the bottom of Ashampoo Burning Studio you can view how much MB in file size you have left on your disc (how much images you still can add to your disc). Note: Even if you inserted a DVD you might see Free Space on CD, but when you keep on adding photos it will change to DVD. 7. When you're done adding photos, you click on Close to close the Add Files and Folders window. 8. Click on the Next button located at the bottom right. 10. Click on the Write CD or Write DVD button located at the bottom right. Ashampoo Burning Studio will now burn your photos to a CD or DVD. Ashampoo Burning Studio Free is a free program for burning and copying CDs and DVDs. If you want to download Ashampoo Burning Studio Free, then click here. There's also a paid version of Ashampoo Burning Studio that has slightly more features and settings than the free version. If you want more information about the paid version, then click here (link with 60% discount). 2. Open Ashampoo Burning Studio Free. 4. Click on the Add button located at the top right. An Add Files and Folders window will appear. 5. Go to the location on your PC where your pictures are stored you want to burn to a CD or DVD. Note: Even if you inserted a DVD you will see Free Space on CD, but when you keep on adding photos it will change to DVD. 9. Click on the Write CD or Write DVD button located at the bottom right. Nero Burning Rom is a well-known program for burning and copying CDs, DVDs, and Blu-ray discs. It's easy to use and has a few extra features. If you want more information about the latest version of Nero Burning Rom, then click here. 2. Open Nero Burning Rom. A new compilation window will appear. If not, then click on File located at the top left and choose New. 3. If you want to burn your photos to a CD, then select CD and click on CD-ROM (ISO), but if you want to burn your photos to a DVD, then select DVD and click on DVD-ROM (ISO). 4. Click on New located at the bottom of the new compilation window. 5. 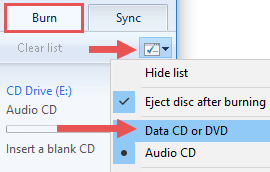 On the right section of Nero Burning Rom, you to the location on your computer where the pictures or folders are stored you want to burn to a CD or DVD. 6. Drag the photos or folders from the right section to the left section. Tip: At the bottom of Nero Burning Rom you can view how much MB in file size you have left on your disc (how images you still can add to your disc). 7. Click on Burn located at the top or click on the Burn Now button located at the bottom right. Verify written data this will verify if the pictures are burned to your disc correctly. This will take more time, but this way you are sure that you will have the correct copy before you delete the photos from your hard drive. 9. Click on the Burn button located at the bottom of the Burn Compilation window. Nero Burning Rom will now burn your photos to a CD or DVD. You can download CDBurnerXP here. 3. Select Data disc and click on OK.
4. In the top section of CDBurnerXP, you navigate to the location on your computer where the pictures or folders are stored you want to burn to a CD or DVD. 5. Drag the pictures or folders from the top right section to the bottom right section. Or select the pictures or folders and click on + Add. Tip: At Remaining Size located at the bottom of CDBurnerXP you can view how much MB in file size you have left on your disc (how many images you still can add to your disc). CDBurnerXP will now burn your photos to a CD or DVD. 5. Go to the location on your computer where the pictures or folders are stored you want to burn to a CD or DVD. 6. Select all the pictures or folders and click on Open (files) or click on Select Folder (folders). You can select all photos or folders at once by pressing the [CTRL] + [A] keys on your keyboard. 7. Click on the [folder ⇨ disc] button. ImgBurn will now burn your photos to a CD or DVD. You can download InfraRecorder here. 3. Click on Data Disc. 4. 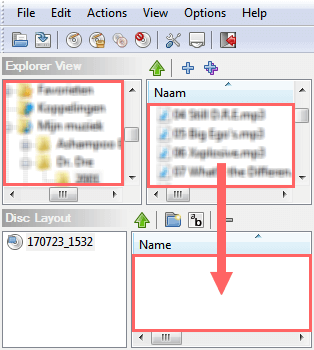 In the top section of InfraRecorder, you navigate to the location on your computer where the pictures or folders are stored you want to burn to a CD or DVD. 5. Drag the pictures or folders from the top right section to the bottom right section. Tip: At the bottom of InfraRecorder you can view how much MB or GB in file size you have left on your disc (how much files you still can add to your disc). 6. 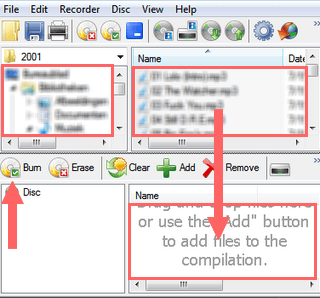 Click on Actions located in the top menu, go to Burn Compilation and choose to a Compact Disc. InfraRecorder will now burn your photos to a CD or DVD. You can download BurnAware here. 4. Click on Add Files located in the toolbar. Tip: At _ MB free located underneath Estimated size on disc at the bottom of BurnAware you can view how much MB in file size you have left on your disc (how many images you still can add to your disc). 7. Click on Burn located at the top left. BurnAware will now burn your photos to a CD or DVD. 1. 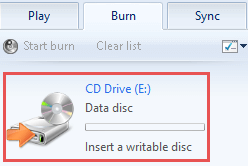 Insert a blank CD into the CD/DVD burner drive of your PC. 2. Go to the location on your computer where the pictures or folders are stored you want to burn to a CD or DVD. 3. Select all the pictures or folders. You can select all photos or folders at once by pressing the [CTRL] + [A] keys on your keyboard. 4. Right-click on the selected photos or folders, go to Send to and choose your CD/DVD burner drive (example: DVD RW Drive (E:)). A small Burn a Disc window will appear. 5. At Disc title, you enter a title for your disc. 6. Select With a CD/DVD Player and click on Next. Your photos will now be copied to your CD/DVD burner drive and your CD/DVD burner drive will open in a new window. If not, then go to your CD/DVD burner drive (example: DVD RW Drive (E:)) located at My Computer or in the left sidebar of Windows Explorer. 7. Click on Manage located at the top left. 8. Click on Finish burning. Microsoft Windows will now burn your photos to a CD or DVD. 3. Click on the "Burn" tab located at the top right. 4. Click on the Burn options ▾ button located at the top right corner and select Data CD or DVD. The burn mode should now show Data disc. 5. Open Windows Explorer and go to the location on your computer where the pictures are stored you want to burn to a CD or DVD. 6. Minimize both the Windows Explorer window and the Windows Media Player window and make sure that the two windows stand next to each other. 7. 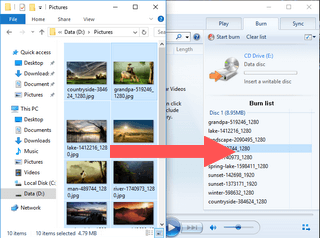 Drag the photos from Windows Explorer into the burn list in Windows Media Player. Tip: At Data disc (_ MB free of _ MB or _ GB free of _ GB) located above the Burn list you can view how much MB or GB in file size you have left on your disc (how many images you still can add to your disc). 8. When you're done adding images to the Burn list, click on Start burn located in the right panel (above the Burn list). Windows Media Player will now burn your photos to a CD or DVD. K3b is a well-known CD/DVD burning application for Linux (e.g., Linux Mint and Ubuntu). 3. Click on New Data Project. Or click on New Project and choose New Data Project. Or click on File located at the top left, go to New Project and choose New Data Project. 4. In the top left section of K3b, you navigate to the location on your computer where the pictures or folders are stored you want to burn to a CD or DVD. 5. Drag the photos or folders from the top right section to the bottom right section. Tip: At Available: _ MiB of _ MiB or Available: _ GB of _ GB located at the bottom of K3b you can view how much MB or GB in file size you have left on your disc (how much photos you still can add to your disc). 6. When you're done adding pictures or folders to your compilation, you click on Burn. Now a small window will appear with a few settings. 7. Make sure that your CD or DVD is selected at Burn Medium. 8. If you want you can select a burning speed at Speed and select a few other settings. 9. When you're done, you click on the Burn button. K3b will now burn your photos to a CD or DVD. Brasero is a simple CD/DVD burning application for Linux (e.g., Linux Mint and Ubuntu). Brasero is installed by default in Linux Mint and Ubuntu. 3. 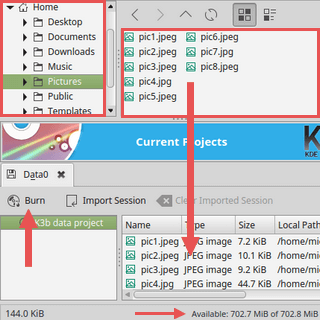 Click on Data project located in the left side menu. 4. Click on the + icon located at the top left. 6. Select all the photos or folders and click on the Add button. Tip: At Blank CD-R Disc: _MB/GB of free space located at the bottom of Brasero you can view how much MB or GB in file size you have left on your disc (how much files you still can add to your disc). 7. When you're done adding photos, you click on the Burn button located at the bottom right. 8. When you're ready, you click on the Burn button. Brasero will now burn your photos to a CD or DVD. Xfburn is a simple CD/DVD burning application for Linux (e.g., Linux Mint and Ubuntu). 3. Click on New Data Composition. 4. Click on the Add button located at the top left. Tip: At the bottom of Xfburn you can view how much MB or GB in file size you have left on your disc (how much files you still can add to your disc). 7. When you're done adding photos, you click on the Proceed to Burn button located at the bottom right. 8. When you're ready, you click on the Burn Composition button. Xfburn will now burn your photos to a CD or DVD.